I'm now 32 weeks preggo (only 8 weeks left - the final stretch!) and with the holiday season fast approaching, I needed a nice bump-friendly dress to wear to office Christmas parties and New Years celebrations. Taking inspiration from this lovely number by ASOS, I used Simplicity 3835 to make a lacy cocktail dress (well, mocktails in my case). This turned out to be a relatively simple pattern to modify to become maternity friendly and I've provided some steps below. Hint: Choose a fabric with stretch such as jersey or bamboo knit (which is what I used). This will be the under-lining fabric. Then use a stretch lace fabric for the top. Step 1: At the waist line, add an extra 2" to the width of the dress. Simplicity 3835 is perfect for this since the waistline is clearly marked on the pattern. Extend this extra 2" all the way down to the bottom of the dress. Step 2: Starting at the bust line point, gradually extend the width out to the extra 2" mark at the waist line. This is marked as the "Transition Zone" on the photo. Step 3: Cut out the under-lining fabric. Lay the stretch lace fabric out, right side down. Then simply lay the jersey pieces (right side down) onto the stretch lace (so the wrong side of the lace fabric will be touching the right side of the jersey fabric). Step 4: Baste the stretch lace to the jersey knit fabric. My serger broke (again - ugh!) so I decided to use french seams so the raw lace edges wouldn't be too itchy on my skin. Unfortunately it's a bit bulky; serged seams would have been a way better move. Oh well, c'est dommage. All in all, I totally love the dress. I feel very feminine in it and the super-soft bamboo knit feels so nice against my skin. 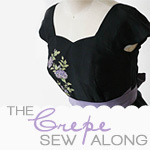 Plus since it's so stretchy, I don't have to worry about expanding too much in the next few weeks - hurrah! In other news, my preordered Minoru pattern arrived from Sewaholic patterns yesterday! I can't wait to make it! I was planning to make a winter jacket, but my hubby's best friend said he would lend me his puffy jacket to wear for the next couple weeks. So the waterproof fabric I bought for a maternity winter coat will now be put to good use on a non-maternity Minoru jacket for once baby arrives. Yay! It looks great on you. Hope you and baby are well.